SDS urged faculty and community groups to demand the university drop the charges, and after a barrage of phone calls, letters and emails, the administration was forced to do so. Many of the charges leveled at SDS were alleged ‘violations’ of policies designed to silence free-speech on campus by outlawing the basic necessities of any large protest. As one example, the use of amplified sound on campus is only permissible within a narrow one-hour window on weekdays, and even then only with the appropriate permit, which can take over a month to pass through the university bureaucracy for approval. For going on a march at the end of a rally, protesters can be found in violation of moving from an approved protest area or of being otherwise disruptive to the campus environment. These policies are an attempt to chill student activism. Students for a Democratic Society at the University of Minnesota continues to stand with Whose Diversity? and recognizes their struggle as a struggle of all students for justice, equity and inclusion on campus. The collective efforts of student struggles on campus are united in fighting the repression of administration and recognize a common goal to defend the right to dissent on campus. It is in solidarity that SDS continues to struggle for justice with Whose Diversity? and calls upon the community to engage with and support the fight for equity and inclusion on campus. SDS is asking that its supporters, who were so vital in its successful fight against university repression, now give their full support to the Whose Diversity? organizers who are facing repression. 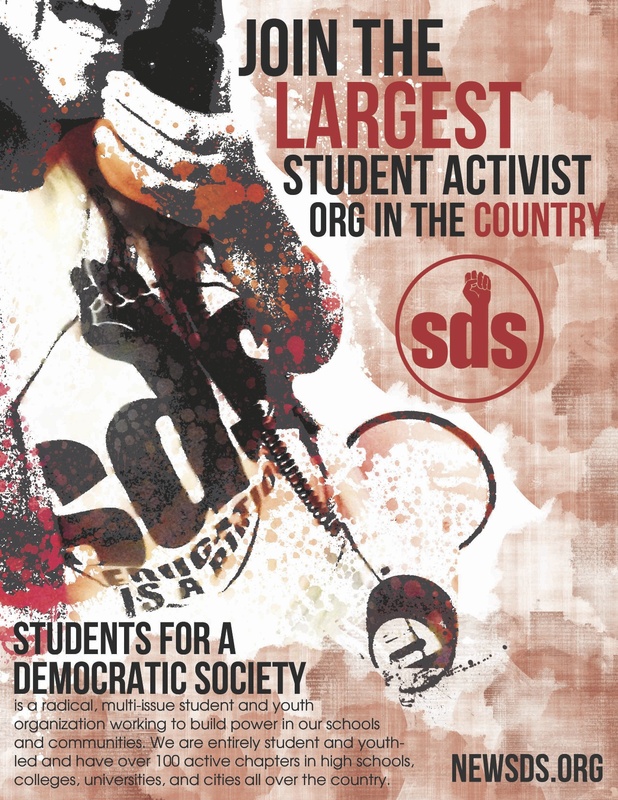 The SDS victory against repression on campus is a major one that will be celebrated as the group carries its work forward to the SDS National Convention, which is being held at the University of Minnesota next fall. Support Free Speech! Stop Political Repression of UMN Activists! SDS at the University of Minnesota is facing punishment for our part in organizing a peaceful and wildly-successful protest against war criminal Dr. Condoleezza Rice. Dr. Rice was brought to campus to deliver a lecture on the “Legacy of Justice,” and was paid $150,000. After an unsuccessful attempt to have her invitation revoked, SDS worked with both citywide anti-war and other student groups to organize a protest against Dr. Rice’s presence on campus. Shortly after the protest, University administrators contacted SDS to inform us that we are facing possible punishment for the action. While SDS has not yet been formally charged, the University is looking into the claim that we have violated the University’s extremely limited outdoor sound policy which, on weekdays, allows for the amplification of sound only between noon and one. This policy was clearly designed to stifle protest and free speech on campus, and in this case is being enforced to punish SDS for a protest that the administration did not want to happen in the first place. If charges were to be lodged against us, SDS could face punishment as harsh as having our rights as a student group revoked. If the administration decides to pursue individual charges using the ‘student code of conduct,’ SDS members could face penalties as harsh as expulsion or the revocation of degrees. We know these are not idle threats as the administration is currently using the student conduct code to punish members of another progressive student organization, Whose Diversity? Now, we ask for all of our supporters and all supporters of free speech on our campuses to call and tell the University of Minnesota that SDS should not face sanctions for our protest against Condoleezza Rice. The Student Union Activities office has threatened sanctions against us simply for exercising our right to free speech. We will not stand idly by as they silence political expression. Take Action: Contact the Student Unions and Activities Office to tell them that SDS and Whose Diversity? should not face sanctions for exercising free speech on campus. On April 17, 2014, Dr. Condoleezza Rice gave the Distinguished Carlson Lecture at the University of Minnesota as part of the series of events entitled, “Keeping Faith with a Legacy of Justice,” sponsored by the Hubert H. Humphrey School of Public Affairs in commemoration of the 50th anniversary of the American Civil Rights Act of 1964. Dr. Rice, an accomplished African-American woman, currently holds a faculty position at Stanford University, where she also served as Provost. During the Bush Administration, Rice served as National Security Advisor, and as Secretary of State, where she had significant influence in crafting foreign and domestic policies for the War on Terror. Given Dr. Rice’s impressive record of accomplishments, it may be surprising that her visit has generated a storm of controversy on campus. Students for a Democratic Society (SDS) demanded that the invitation be rescinded on grounds that her involvement in the prosecution of the War on Terror raises serious ethical concerns. The Minnesota Student Association (MSA), as well as President Kaler, countered that universities are places for the free exchange of ideas and that we must welcome those with differing viewpoints instead of banishing them from campus. The authority of Dr. Rice to speak on the subject of a “legacy of justice” has also invited hot debate. Some have noted that as a successful African-American woman, her experience can shed light on how minorities and other disadvantaged groups can overcome obstacles to succeed. This experience implies that she can speak with authority on the legacy of the civil rights movement. Others have objected, arguing that she is not a recognized advocate for nor expert on American civil rights and that her actions while in public office resulted in serious human rights violations that run counter to the principles of the civil rights movement. The controversy surrounding Dr. Rice’s visit provides an excellent opportunity for the university community to reflect on issues of both free speech and accountability. What is “free speech”? What constitutes a violation of freedom of speech? Who speaks for the civil rights movement and its legacy? Is the concept of civil rights something that stops at the borders of the U.S.? What is the role of universities in holding public officials accountable for their actions in office, be those domestic or international? Students for a Democratic Society at the University of Minnesota stands in solidarity with the students who staged a sit-in and occupied the Old Queens Administration building of the New Brunskwick campus of Rutgers University. 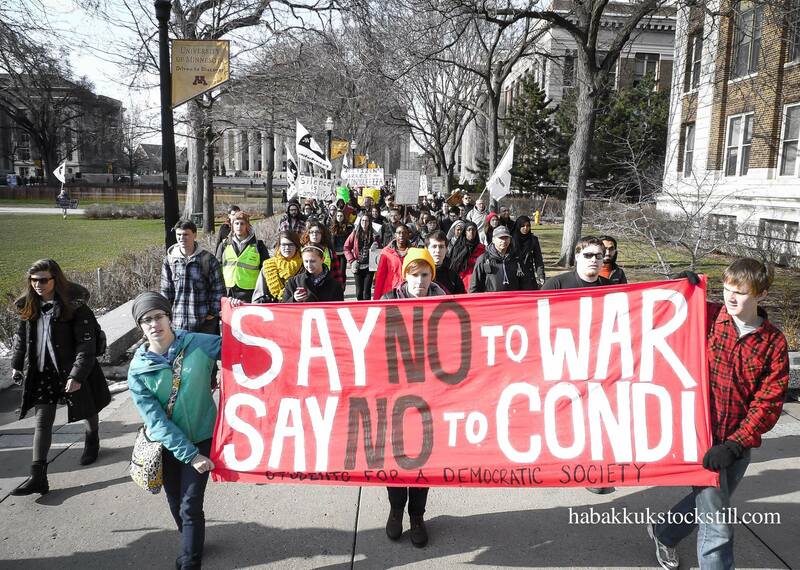 It was only weeks ago, on April 17 that SDS-UMN led a protest of hundreds against the “honorary-lecture” given on our campus by War Criminal Condoleezza Rice. Like students at Rutgers who have 350 faculty that have signed on to a petition calling for the University to disinvite her, SDS-UMN had over 200 faculty members condemn her visit after the administration led by Presdient Eric Kaler called her honorary lecture a matter of “free-speech” while at the same time he has worked hard in weeks since to silence and punish student activists for protesting and exercising their right to free speech. We recognize that “free-speech” does not come with $150,000 or honorary degrees. We further recognize that Rutgers President Barchi is cut from the came cloth as our own President Kaler and they are both convinced of their absolute authority to both pay former Secretary of State Condoleezza Rice to speak at our Universities but also to reward her war crimes with “distinguished lectures” and honorary degrees. Students struggle across the country from Stanford to the University of Minnesota and now to Rutgers to highlight the historic track record of Condoleezza Rice as a flip flopping politician, former Oil Executive, who lied to the American public about “WMD’s” in order to invade Iraq, then tortured hundreds if not thousands of people from Abu Ghraib to Black Sites scattered around the world. From The University of Minnesota to Rutgers University we say kick Condoleezza Rice off Campus! For years we as students are educated and work hard to earn our degrees only to see our Universities rewards and honoring criminals and professional liars. Our voices will be heard! We in SDS-UMN call upon President Barchi to meet with students, hear their demands and to disinvite Condoleezza Rice now. Kick War Criminals Off Campus!